This interesting surname, found in England, Scotland and Ireland, has a number of possible origins. Firstly, it may be of Anglo-Saxon origin, from the Olde English pre 7th Century and Middle English "dunn", meaning "dull, brown, dark-coloured", and was a nickname for a man with dark hair or a swarthy complexion. It may also have originated from an unrecorded Middle English survival of an Olde English byname, "Dunna", dark. Secondly, the surname is widespread in Ireland, where it is the Anglicized form of the Gaelic "O'Duinn, Doinn", composed of the Gaelic prefix "O", male descendant of, and the personal name "Duinn, oinn", from "donn", black, brown, a byname given to someone with dark hair or swarthy complexion, as above. In Ireland the name is usually spelt "Dunne", and the sept originated in County Leix and formed one of the principal families of Leinster where their chief was the Lord of Iregan; they were especially mentioned in mid 16th Century documents as hostile and dangerous to the English interest. 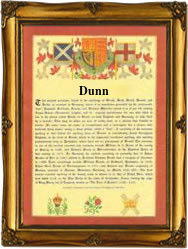 Those who spelt their name Dunn usually came from Ulster, where they were possibly of Scottish extraction. Finally, in Scotland, the surname also derives from this Celtic origin, but may also be locational from the lands of Dun, Tayside (Angus), which derives from "dun", fort. Early recordings include William Dun (1180, Gloucestershire), John le Dun (1198, Hertfordshire), and Adam de Dun (1255, Scotland). A Coat of Arms granted to a Dunn Family in Bircher, near Leominster, depicts quarterly first and second silver, a gold wolf salient, second and third, black three round gold buckles, tongues downward. The first recorded spelling of the family name is shown to be that of Gillananaomh O'Duinn, which was dated 1102, in the "Ancient Irish Records", during the reign of Irish High Kings in Opposition, 1103 - 1169. Surnames became necessary when governments introduced personal taxation. In England this was known as Poll Tax. Throughout the centuries, surnames in every country have continued to "develop" often leading to astonishing variants of the original spelling.